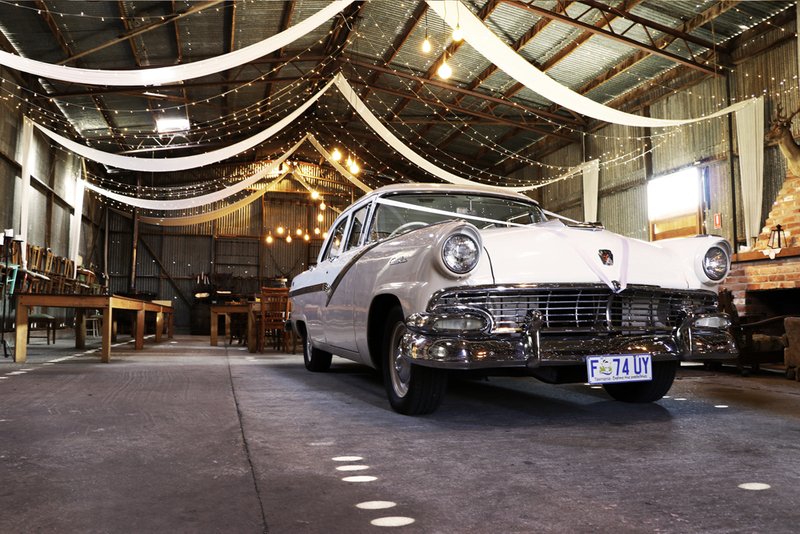 The ‘Cuzzy’ – Our classic wedding car. For too long the North West Coast of Tasmania has been deprived of quality services and luxury vehicles for both Brides & Groom’s. 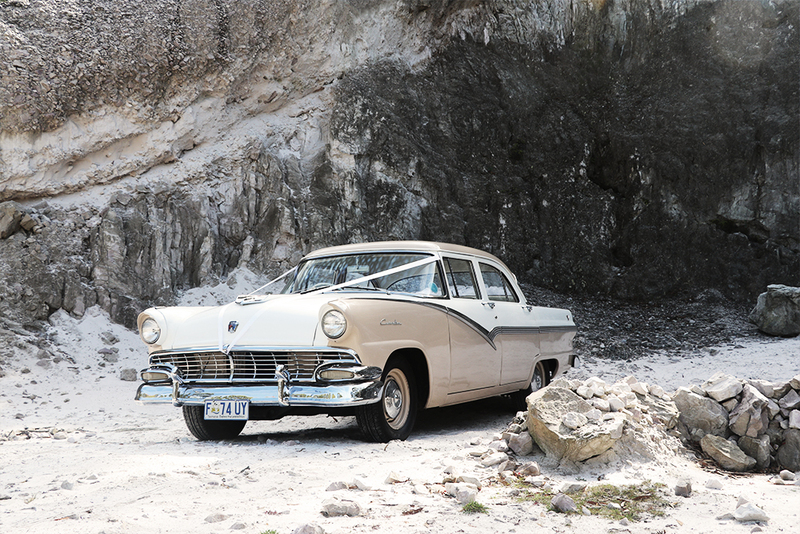 That’s why our newest addition to Grand Touring is our 1957 Ford Customline, which perfectly captures what a wedding vehicle is meant to be. We are proud to announce the latest addition to our family, the 1957 Ford Customline, with a 3 speed manual and 272 Y-Block 8 cylinder engine. A complete restoration was recently undertaken on this classic & it has been kept in immaculate condition since. The vehicle is now available to the public for wedding bookings and special events across the North West Coast of Tasmania. The Cuzzy has been part of our family for over a decade and is one of our most prized possessions. Both the interior and exterior have been brought back to life, featuring immaculate vinyl interior, stunning chrome detailing and a fully restored engine, so when it drives across the coastline here in Tasmania it turns heads! 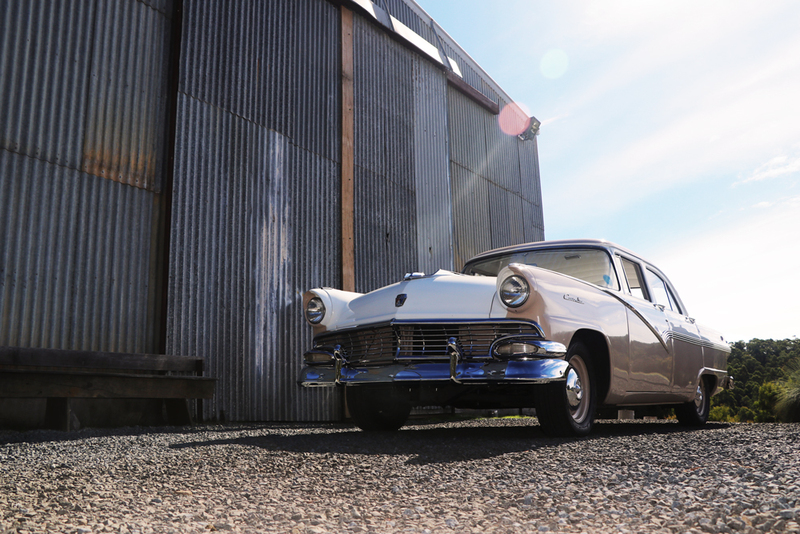 Our classic Ford Customline at Sandridge Estate. The Cuzzy features bench seating for up to 5 passengers, plus the driver. The roomy interior provides couples with plenty of space and is perfect for brides wedding dresses. The large rear doors provide plenty of room for getting in and out of the vehicle. The restored interior will allow for perfect photo opportunities when you arrive for your big day and your photographer’s job will be made easy as all aspects of this car are incredibly photogenic – meaning more quality photos. 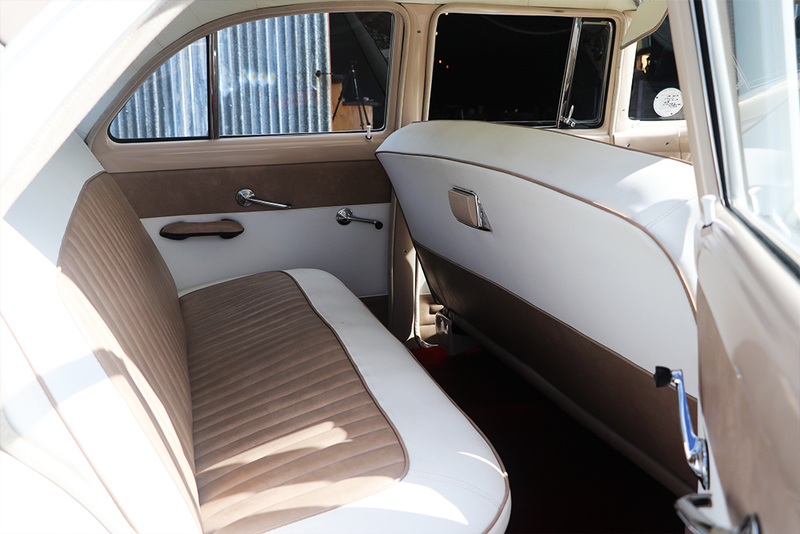 The interior seats are perfectly suited for wedding dresses. You can be assured that when you book with us for your biggest day, your wedding car will be immaculately clean & presented with care & precision. You will also be accompanied by a friendly & experienced driver who will ensure the perfect drive for your big day. We have highly trained staff, vehicle co-coordinators & our own experienced mechanics that will make sure your day runs smoothly. We will assist in taking the stress out of organising your wedding transport for you, whether it be limousines, classic or modern cars, coaches or vehicles to transport your guests. The Customline was produced by Ford Australia between 1952 & 1959. The Customlines body was hand made in Australia and the chassis were imported from overseas. In addition to the Customline sedan, a limited number of station wagons were produced. The original 1952 model was updated in both 1953 and 1954 to match the updates being made to the US Fords. Being powered by a Flathead V8 which went into the Australian production in 1952. In 1955, the body was used for four model series in Australia. The 1955 model was powered by the overhead valve Y-block V8 which was under partial Australian production with locally sourced components. The 1956 model incorporated a new body still featuring the 1956 US Customline grille, 12 volt electrics and a new Fordomatic automatic transmission option. The 1957 model retained the 1956 lavish body details but featured a large V8 badge positioned in the grille and also utilized the 1956 Ford Fairlane trim. They changed the lettering in the Fairlane’s rear emblem to Customline, chromed the headlight surrounds and added a large V8 badge to the grille. A special tri-colour option was made available, which added extra chrome and a third colour to the body sides which stopped Aussies in their tracks. Whilst keeping the reliable & tested 1954 engine and chassis, it was the upgrades to the exterior appearance that made this model the most revered of this Customline series. 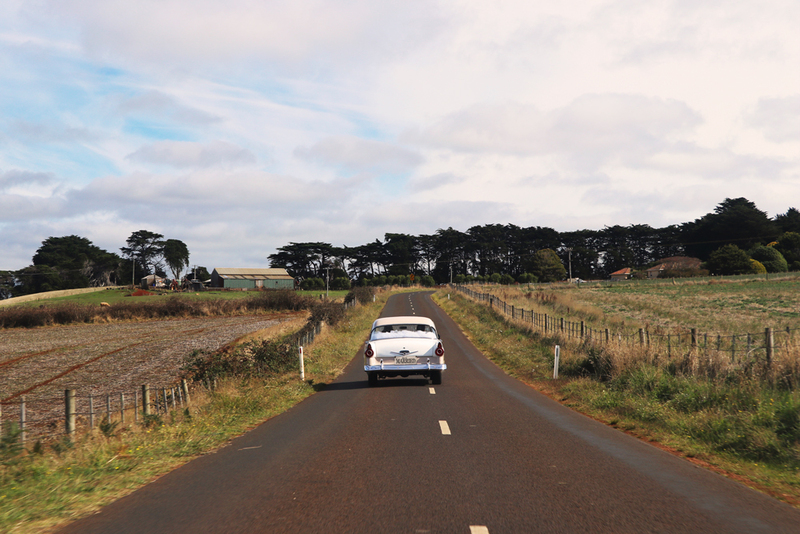 Just Married – North West Tasmania. Visit our Wedding & Special Events Tasmania page to make your booking.